The first International Raw Materials Extraction Innovation Conference brought together individuals and companies working on EU-sponsored projects to exchange knowledge and explore synergies in innovations in the extraction of resources. On behalf of the Real-Time Mining Consortium, the Resource Engineering Section of TU Delft (CiTG – Resource Engineering) organized the conference in Central Amsterdam at Koninklijke Industrieele Groote Club on Oct 10th – 11th. The Real Time Mining Project is an EU sponsored H 2020 project. In addition to the Real-Time Mining Consortium, other H 2020 projects such as VAMOS, Solsa and UNEXMIN participated. The partners from the different consortia represent a diverse group of nationalities from 14 European nations. Presentations were wide ranging, from exploration onshore and in flooded mines, autonomous navigation, robotic mining, swarm robotics and space based extraction from the moon, asteroids and Mars..
As a result of the conference a number of common themes have been identified. These include real time data acquisition and analytics, robotics and the need for multi- and cross- disciplinary interaction. It highlighted the fact that traditional mining skills are no longer sufficient in a resource constrained world and that there are huge opportunities for innovation and “out of the box” thinking. Common themes amongst the different project groups were ‘Resource Modelling and Value of Information’; ‘Automated Material Characterization’; ‘Positioning and Material Tracking’; ‘Process Optimization’ and ‘Data Management’. Further details of the conference, including a copy of the proceedings volume can be found on the Real Time Mining project website at https://www.realtime-mining.eu/. 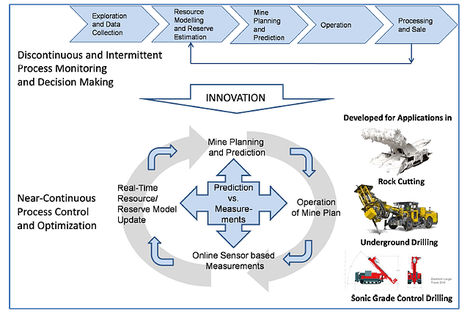 Benndorf J, Buxton, M.: Real-Time Integration of Sensor Data for Improved Grade Control. At SME Annual Meeting 2017 in Denver, Co. Febuary 19th to 23rd 2017.